With most bespoke tailors worthy of the name, the quality of construction is pretty consistent. Everything worth the effort is done by hand: chest padding, inserting sleeves, sewing buttonholes. The French may double-sew their buttonholes; the Neapolitans may work their sleeves in under the shoulder; but in the end these are mostly questions of style rather than quality. Quality is easy to analyse. It is much harder to find any objective parameters for style. And in the end, most men I know who have clothes made for them end up sticking with the tailor whose style they like. Geeky points of bespoke technique are only more important to men who haven’t much of it made. In the end, you have to feel you look good. The difficulty of analysing style makes tailors that have it perennially interesting. 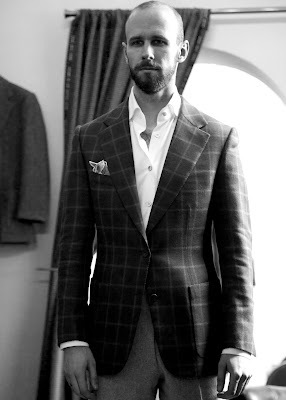 Thom Sweeney (Thom Whiddet and Luke Sweeney) is one such tailor. Their horseshoe, single-breasted waistcoat is instantly recognisable. They cut jackets a little shorter (while still covering the rear), sleeves a lot narrower and cut away aggressively from the waist button. It could be considered trendy; but as with any of the truly stylish tailors, it is underpinned by a fundamental understanding of the benefits of traditional tailoring. All of which is context for saying that I had this jacket and the corduroy trousers below made. The jacket is more aggressively styled than anything else I’ve had made bespoke. And I find that intriguing. I can just feel the sleeve in the crook of my elbow when I bend my arm. But it is not uncomfortable. The back feels close, but not restrictive unless working at a desk all day (and many traditional tailors cut close here too – John Kent being one). The cut away, length and shape of the lapel I find subtle enough to be stylish without drawing attention to any one element. Indeed, I think the most interesting thing about the style is the line achieved by a broad lapel (3.75 inches), a low buttoning point and a sharp cutaway. Regardless of the shape of the individual, this is flattering. Incorrect, perhaps, in some tailor’s eyes. But certainly attractive. We did take a few attempts to get the sleeve length right. The house style shows a little more cuff than I would naturally. But that was fixed on the third fitting. Just as important as cut, is cloth. Thom and Luke are the only tailors I know in London who have always stocked Cacciopoli bunches (and not just suitings, which have been distributed in England by other Italian distributors for a while). Cacciopoli has a wonderful range of cashmere jacketings with original colour combinations, and silk/wool/linen summer. This navy windowpane check is a Cacciopoli cashmere jacketing and I love it. Cacciopoli is not actually a mill, merely a seller of other manufacturers, but the range it puts together, particularly the cashmeres and summer mixes, is distinct from any English mill and most of what Zegna or Loro Piana sells here. 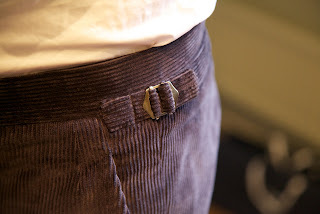 The trousers have been worn several times and, being corduroy, have quickly assumed their own, irregular shape. But the narrowness of the fit (verging on too slim) reins in that natural looseness. Plus, I like having them in grey – it escapes the old-country associations of the normal beiges and browns. A good experience with a very stylish tailor. You can tell that from the décor, right? You can follow the discussion on Thom Sweeney jacket and trousers by entering your email address in the box below. You will then receive an email every time a new comment is added. These will also contain a link to a page where you can stop the alerts, and remove all of your related data from the site. Great post. On the pants; how much cuff do you wear? I’m very biased, but I think the waist suppression looks particularly good here. To me this looks stylish and classic, without being fashionable, if that makes sense? I know what you mean Matt. It is pushing gently at those classic traditions of fit, but not forcing the point. I was here last week for my first fitting and I saw you… As you say their style is quite agressive but to me it is what I call personality and bring the suit or the jacket alive. To me Thom Sweeney has achieved a very good balance between old school british tailoring and coolness. Hi Christophe, nice to hear from you. Napoli – based on my experiences, Solito, Rubinacci (make sure you get a fitting with the cutter) and a young guy, Elia Caliendo. Some of the absolute best stuff I’ve seen you get. Both pieces are fantastic; energetic and vibrant in cut and style. Viable alternates to Rubinacci are Sartoria Ciardi and Sartoria Panico respectively. The former apprenticed with Signor Blasi and is recipient of the “gold scissors” award in Italy & the latter was formerly the head cutter at Rubinacci during the 80s – 90s. Definitely one good example of modern style – and still not over the top or to fashionable. Looks really great – congratulations! And the price is? I love the cut and length of the trousers. But that jacket is the nicest cut I think I have ever seen. Simply gorgeous!! Simon, can you give us an idea of price for the cords? they look absolutely fantastic. Simon, Do you know if it is possible to order fabrics directly from Cacciopoli. Your jacket looks beautiful. 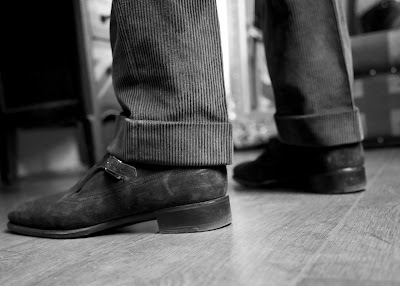 Its that Edward Green oundle suede shoes you are wearing? One of your best yet. Dashing beyond words! At the moment, bespoke suit from 2300 and up. 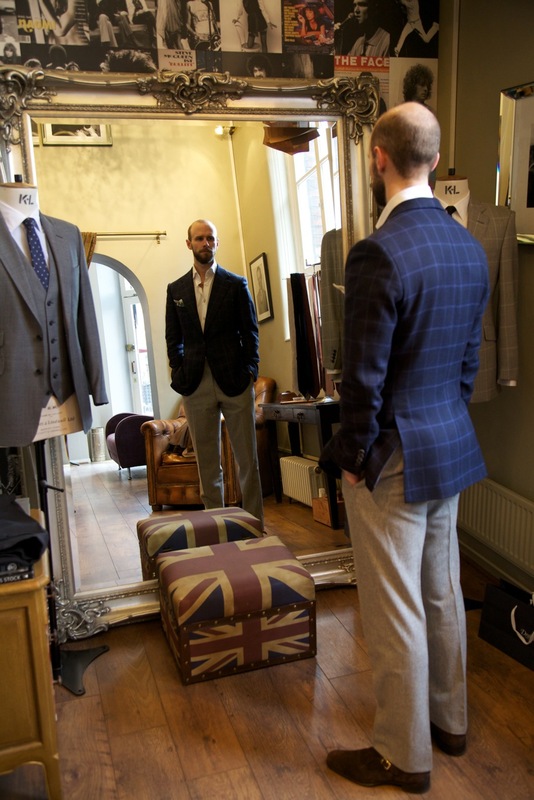 Hi Simon – just in case readers stumble upon this old post, from my most recent visit, bespoke at Thom Sweeney is just under £3,000 for a two piece (with entry level fabric). So coming on par with other established off-Row tailors. I still highly recommend them despite the price increase. Chucky, I don’t know on Cacciopoli but a simple phone call should find out. The shoes are Alfred Sargent Handgrade. Nice, aren’t they? Do you know of any other places in London that use Cacciopoli? I cannot seem to find a website for them. I once saw a lovely Cacciopoli tweed in book at William & George on Kingly street however I would prefer someone else to make me a jacket. Lovely pieces from Thom Sweeney by the way! Simon, if you are thinking of commissioning more from them, I highly recommend their deconstructed jacket, fully lined with the fabric, and hardly anything in the shoulder. In terms of comfort, it’s a total revelation, and Thom can still get plenty of shape in the waist. I’ve had a Cacciopoli wool/linen/silk suit done this way, a flannel jacket, and Thom is currently doing a tweed jacket for me. It’s the perfect combination of sharp cut and extreme comfort! How much would you consider Thom Sweeney’s house style Italian-influenced? I am referring particularly to the trousers. The shoulders look very sloped, could they not try to disguise that, as a good tailor should? Otherwise nice! Think TS claiming that just off of Oxford Street is Mayfair is with an estate agents eye though. can you provide any information on the price range of Thom Sweeney’s services? Where does a 2pc suit start? Try scrolling up a few comments…. The slope of the shoulders are aging. Old men have these shoulders. Of course the lack of hair isn’t helpful, but the shoulders age you a couple of decades. Maybe workout on your shoulders to lift them? You can’t lift shoulders by working out, only make them wider and more rounded. That’s the mistake short and narrow people make. Simon, I think you are a very very good looking man, and I think this is one of your best commissions yet. I wouldn’t take some peoples’ comments seriously at all. I am a fan of your posts. In fact, your reviews on Thom Sweeney made me go there, but I was really disappointed. To give you a brief idea of what I went through, please read two of my emails to the tailors below. Any suggestions on how I can handle my issue with them? or is it just better to forget about my remaining deposit (which is around 3170 GBP) and consider it as a learning experience? I don’t accept the proposal you sent me earlier. We have already discussed extensively the problems with the delivery of my order, including the issues with (1) not being on time, despite a mutually agreed delivery date that was important because of a formal social event and (2) providing me with below-par quality trousers and other items. As you know, after a lenghty process in which we moved no closer to your supplying me with a properly made set of clothes, we decided to finish our tailoring relation to avoid further problems. On an aside, i only wish that the company logs you are now citing, would have helped you to stick to the agreed to deadlines earlier. I have no intention to detail all my legitimate complaints with the order once again but I do wish to remind you of our gentlemen’s agreement that we will close my account with your store and I that I will receive a full reimbursement of my deposit. For the record, I have no confidence that the clothes that you now say are ready for my collection will be up to standards given the earlier problems. I am very disappointed that after the poor experience with the tailoring, I now have to keep reminding you to complete the financial side of our dealings. In a succession of emails, I have asked you to respond to some very reasonable requests and deadlines. So far, none of these messages have received an adequate answer. As I said before, I understand that you have been on a holiday, but that should not prevent someone in your firm to handle my case and deal with the very real problems I am facing. Especially since it is a long holiday and I asked explicitly Matthew to make sure that someone else handle my case in your absence to ensure that I can get at least one/two of my 5 trousers to use for my trips. Let me once more (for a final time) document the problems. First, two of the trousers that I collect had key tailoring issues in the backside. I informed Matthew that people clearly noticed that the line between the pockets was asymmetric. Second, the material deteriorated so much after wearing them just once that I would be ashamed to wear them again. Third, ignoring my email where I simply asked about the possibility of collecting one trouser before my European trip. Fourth, however, as you well know, I need a suit by early September. As I have not done any fittings yet, I don’t know how you will deliver these on time. I have not been contacted to start doing the fitting of my blue suit, for which I informed you a very definite deadline exist (which is early September). I even mentioned to you that you can postpone the jacket as the suit has priority. Now, we already in the first week of September and did not do a single fitting. I am perplexed with the complete lack of service or attention. An example of which is that I even have to remind you of appointments. Ironically, Matthew informed me that I developed a reputation for sending too many emails/texts. This is ironic because without my gentle reminders nothing regarding my orders would have moved forward. Although in fact no movement has been achieved. I don’t want to mention that I made an order for a jacket for which you forgot to take my measurements and I had to remind you of that. Again, ironically, the only phone call I did receive from Matthew was to collect the payment on my invoice. And I paid the amount due. All of this gets compounded by the fact that I am spending on extraordinary amount of time in trying to get your attention to ensure that what agreed upon is indeed delivered. I made the first order of 5 trousers, one jacket and a suit with the intention to making this in to a longer term professional relation. I started with you in April and received none of my orders. I am a client who values reliability and trust. I am so sad to say that I lost trust in your firm and do not think it is productive to continue the relationship. Therefore, since you did not deliver any of the items, I am asking for a full refund of the money that I paid (please see attached the invoice. As per the invoice, I paid GBP 6170 out of GBP 8445). I mention at the end of the email my bank details. Since you are away, I am ccing Thom here with the hope that he can take an immediate action as per the above. One more time, I understand the people take vacation time, but I cannot understand why this should mean that as a client I need to bear the costs. Someone should be delegated the responsibility to make decisions on a case and make good on promises made to the client. I am also wondering whether you yourself would like to be treated in the way your firm has been treating me. What i am asking does not involve rocket science, just a little bit of due care and attention. I don’t know how some can pay for the deposit on 5 trousers & jackets etc all at once, instead of paying first for just the one jacket+trousers – and seeing how it goes.. 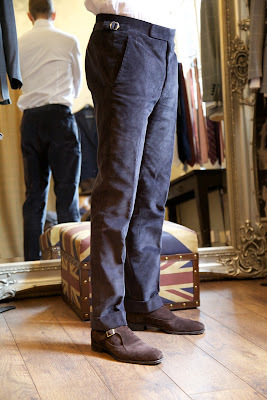 I really like the look and fit of the corduroy trousers. I am keen to invest in some tailored trousers – grey flannel for a starters, but possibly some in corduroy as well having seen the above – so was wondering if Thom Sweeney are a good place to start or if you would recommend any other alternatives? What i am thinking is to go for slightly light weight Corduroy in Navy (1.75/2 inch turn-ups) or cotton in slightly cream colour. I am working in an investment fund, so the dressing code in our office is quite flexible, but smart casual for sure. My jacket is in Navy, blue and grey prince of wales done by GB . I’m looking into a bespoke sports jacket, and considering either Steven Hitchcock or Thom Sweeney. Quite different styles of course, but from what I’ve seen I like both. My build is huskier – larger shoulders and chest, slenderer wait – and I’ve always been afraid that a drape-style jacket would exaggerate this to cartoonish effect; all the best examples I’ve seen of drape have been on slender people. That and the fact that they are cheaper makes me lean towards Thom Sweeney. Do you think there’s legitimacy to my concerns about drape? Also how would you compare your pieces from the two tailors in terms of comfort, quality, longevity, etc.? I wouldn’t worry too much about the drape cut on a larger man – particularly if you have a slimmer waist. It will still be very flattering. Do make your concerns known to Steven though. I would make your choice largely based on the style. As you say, they are quite different. On my pieces, Steven’s is certainly more comfortable, as you’d expect with a drape cut. Both have worn well though. Thanks for the advice. I went with Thom Sweeney, largely based on style. Quite looking forward to seeing the final jacket made up! Hi Simon, I have an appointment at TS in the coming weeks to choose a suit for my wedding. My dilemma is I do not wear a suit for work nor on any other regular occasion. I was contemplating going bespoke but the thought of spending that much for the suit to maybe come out once a year is something that is not sitting too well. Therefore I thought the compromise of MTM would be a good one and redirect the savings towards a bespoke/MTM pea coat a piece I would get a considerable more wear out of and thus justify the money spent. Back to the suit, I would like to be able to wear the jacket on occasions so having versatility in the fabric I choose is very important rather than choosing something for the time of year etc. My chosen colour is going to be a grey the shade of which is again to be decided. But I would like to know your thoughts on my proposals and any recommendations towards fabrics? That sounds like a good idea on the MTM suit and later bespoke coat. Thank you for your reply I can attend with confidence now in my decision. I shall update the thread with how it turns out. I just collected my bespoke sports jackets from both Thom Sweeney and Steven Hitchcock. Steven Hitchcock made me a green donegal jacket, which is already one of my favorite articles of clothing. Very well made, very comfortable, and very handsome. The drape in the jacket is quite a bit more subtle than I expected, and has the effect of providing just enough shape with exaggerating anything. Thanks for your suggestions! I’d happily use either of these tailors again. Update on my experience with these tailors. I just had a second jacket made by Thom Sweeney – a navy hopsack (scabal rhapsody bunch) DB. Spent a little bit of time with Eithen and Oli designing the lapels, and went with roped shoulders this time. This turned out beautifully, and (unsurprisingly) fits even better than the first one. Steven’s jacket is still wearing quite well, though it’s a bit too warm for summer wear. If anything, this jacket looks even better after settling in a bit. Would you mind telling where your light grey trousers are from in the first photo? What type of cloth is it? Wanted to thank you for your blog as it helped immensely in the process of commissioning my first bespoke suit. I explored several options but decided on Thom Sweeney largely on style. The final result is a wonderful navy suit in 13oz worsted wool. Quite basic but consistent with your sound advice. I cannot be more pleased with the final product and -perhaps more importantly- the process itself and the pleasant interaction with Thom, Eithen an Luke. Life’s enjoyment is about experiences and to me going through the process of creating something along with these craftsmen was probably as rewarding as the final product.